I found a cheap plastic candy dish (I guess that is what it is) which was 99c and a stainless steel mixing bowl (I knew the tapered bottom would make it easy to remove) which was marked down from 99c to 49c since it was half-price day. I knew the funky shape of the candy dish would give me a great shape for the planter but I didn’t realize it would actually come out looking like a flower or a sun.. with ruffled/scalloped edges. It was a pleasant surprise. 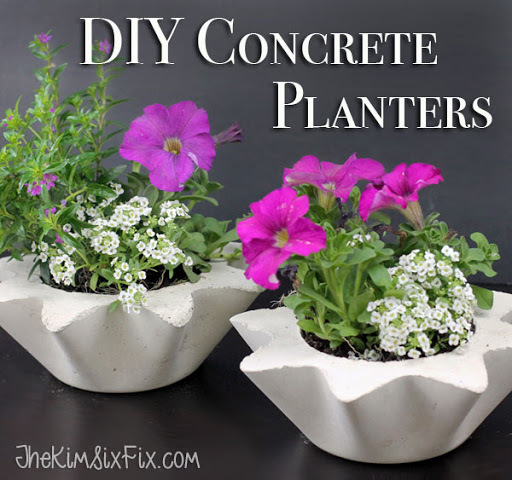 Pour the concrete into the greased candy dish and then smash the bowl down into the center to create the reservoir for your actual planting area. If the bowl doesn’t stay down in the concrete you can add some weight to the bowl. Be careful since the edges are still fragile at this point, the concrete is soft! Using the bamboo skewer I poked drainage holes in the bottom of the planter (you don’t have to do this but I knew mine would sit under sprinklers and didn’t want a lot of water to pool inside of them. After letting it dry over night the planter popped right out of the mold. So of course I made another. A little potting soil and some Petunias and they were ready for the yard! Now I want to make a few that are a little larger. Since I can’t get enough concrete!